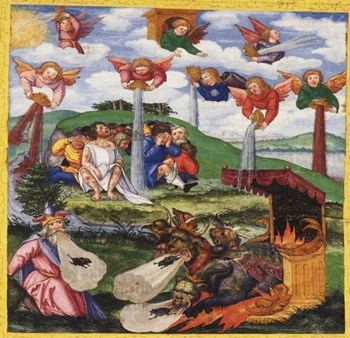 When the Temple of God opens, revealing the Ark of the Covenant (Rev 11:19; 15:5; Ex 40:1-3), the apostle John perceives the appearance of the seven angels with the seven plagues as a "sign in heaven" that was "great and marvelous," because "in them, the wrath of God is finished" (Rev 15:1). When the seven angels who had the seven plagues come out from the Temple of God, they receive from one of the four living creatures a bowl of God's wrath (Rev 15:6-7). The plagues and bowls of God's wrath are significant for the judgments they render; it is a terrible time. But instead of repenting amidst this great suffering, the people did not fear God, blasphemed His name and failed to recognize that He was Lord of all. People preferred to follow the "great men of earth" and would be unable to hear the gospel (Rev 18:23). What does it mean to be hard hearted?